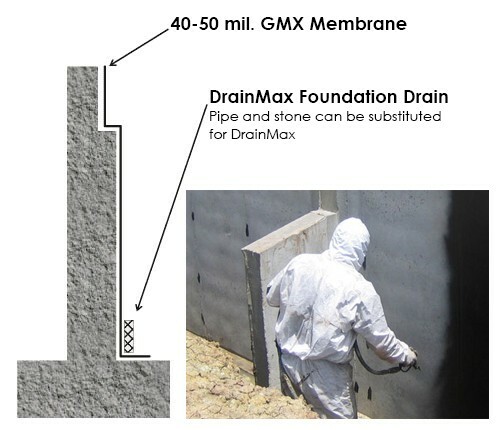 Atlantic Concrete Contractors is a certified applicator of GMX Waterproofing Membranes. GMX Elastomeric Coating is a black, liquid applied, single component, moisture cured polyurethane coating. It is designed to form a seamless, flexible rubber membrane which is impervious to moisture. When cured, GMX Elastomeric Coating permits expansion and contraction over a broad temperature range while maintaining its waterproofing properties under the most demanding conditions, including continuous exposure to water. Our crews install a drainage system board to protect the membrane and install a foundation drain to carry groundwater away to daylight or sump. We have completed numerous industrial, commercial, and residential projects using this waterproofing system. Our management can estimate, schedule, and assist you in managing your next waterproofing and drainage system project. Call us today at (706) 922-6803.